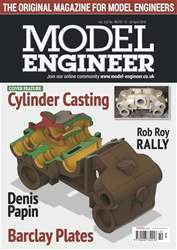 • Model Engineer Exhibition: The Club Stands - The editor reviews some of the exhibits to be seen on the club stands. 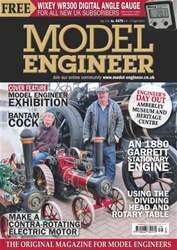 • A Lancashire Mill Chimney - Peter Chadwick models a landmark. • An 1880 Garrett Stationary Engine - Anthony Mount continues with his new engine. • The Garden Gun: An Ornamental Cannon - Terence Holland undertakes some decorative engineering. 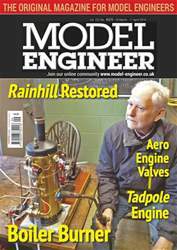 • Making a Contra-Rotating Motor - John Rutter modifies readily available motors for flight. 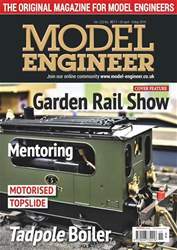 • Rebuilding a Myford ML7 Lathe - Alan Hearsum refurbishes and partly renews a popular lathe. • MEX Competition: General Engineering Models - Mike Chrisp concludes his Judge's Report.